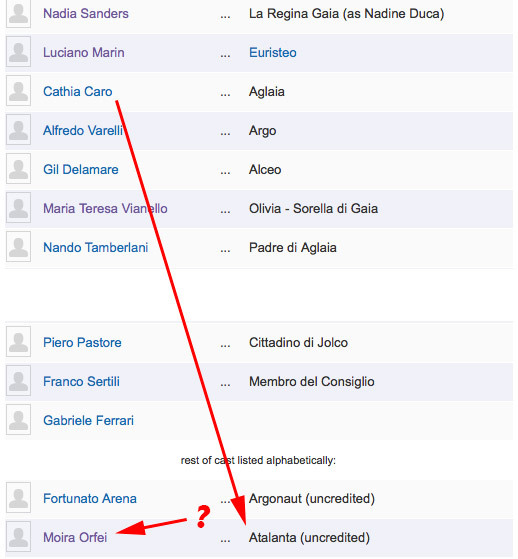 IMDb is well known for having many mistakes in their credit info of old Italian films. THE GIANTS OF THESSALY is a good example. In their information, Moira Orfei is credited as Atalanta. Cathia Caro (above) is actually Atalanta in the US version of the film but in the French version, Cathia's character is named Aglaia, also as written in the IMDb credits. I don't know how Moira's name ended up in this film but she's definitely not in it. Cathia should be credited as Aglaia and Atalanta. They most likely changed her name for the English version since Aglaia actually sounds like Ugly and Cathia is not ugly. Ah, the confusion!